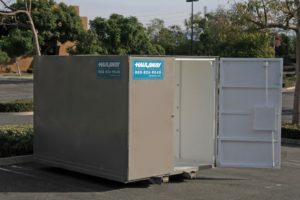 If you need temporary remodeling storage to securely store your belongings during your project, Haulaway Storage Containers is the perfect—and affordable—solution. Some home remodeling work requires furniture storage during construction. There’s no reason to rent a truck and move your belongings to a pricey, off-site self-storage unit when you can have a home construction storage container delivered right to your doorstep the very next day. The home construction storage you need, when you need it. The best way to keep your valuable pieces safe and clean is by renting a metal storage unit. Haulaway’s home construction storage containers are clean, highly secure, and water-resistant. They come in a variety of sizes, including extra-large sizes that can accommodate more or bulkier items, and are made of 14-gauge steel with hardwood and steel floors with convenient ground floor access. Temporary remodeling storage units are a versatile source of as-needed space for people whose homes are under construction for a short period of time. Homeowners really enjoy the convenience and affordability of our rentals, because they can easily store furniture and other belongings while they’re remodeling their homes. Feel confident knowing that your furniture, appliances, and personal belongings are safe and within easy reach if you need them with temporary remodeling storage from Haulaway Storage Containers. High security, service, and customer satisfaction is what makes us the industry leaders in storage containers. Our company offers the best selection, the fastest delivery, and the right portable storage solution for you at a cost that’s easy on your wallet. When you require extra space, think of Haulaway!